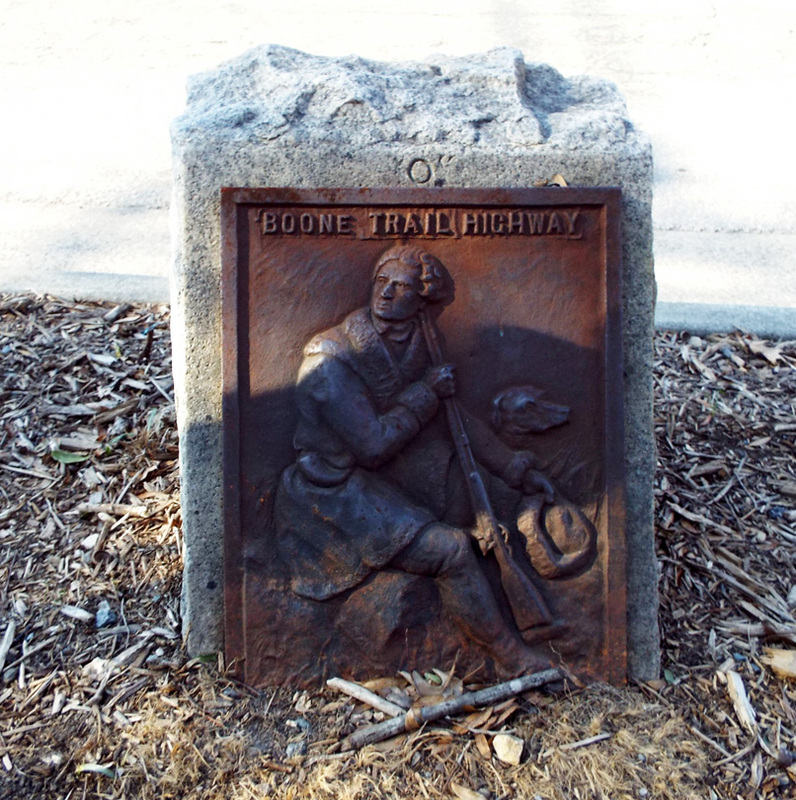 This Boone Trail Highway marker shows an image in relief of Daniel Boone and his hunting dog taken from an 1861 illustration by Alonzo Chapel. It is attached to the front of a small block of granite. The tablet is a steel Style-2 which was seen as early as 1919, used through 1926 and distinguished by the BOONE TRAIL HIGHWAY caption being in block letters. The bottom inscription is not visible being buried beneath dirt and mulch. That this marker was attached to a small granite block is unusual. Most commonly they were attached to large arrowhead shaped monuments much like the one in Hillsborough. This Boone Highway marker was numbered 35 by Everett G. Marshall. His interest and research of the markers led to the book, Rich Man: Daniel Boone. The numbering system was simply the order in which he found or became aware of a marker. The marker was re-dedicated in March 1938 having been removed for the widening of Franklin Street. Replacing the marker was delayed after it was questioned if Daniel Boone had ever passed through the area. The marker re-dedication proceeded only after court records from Granville County showed that Daniel Boone had once bought a horse from Colonel Robert Burton there. The marker is located on the University campus side of E. Franklin St. across from the old Chapel Hill Post Office. A Jefferson Davis Highway marker is a few yards away. The memorial marker rests in a narrow landscape area that separates Franklin St. from the sidewalk along McCorkle Place. The marker is near its original location but was moved to accommodate the widening of Franklin Street. It originally faced towards the street.